We are actively representing victims of abuse by Dr. Reginald Archibald. If you were a victim of sexual abuse, you have a limited time to take action. Contact us today to find out how we can help. Madison Square Boys Club: A number of our clients met Dr. Reginald Archibald through the Madison Square Boys Club, and we have learned that he sexually abused children at the Boys Club. You can read a New York Post story about our clients and an interview with one of our attorneys by clicking here. We are actively investigating what the Boys Club knew about Dr. Archibald, and we have asked it to share what it knows about him. If you met Dr. Archibald through the Boys Club, or have information regarding his role at the Boys Club, please contact us. 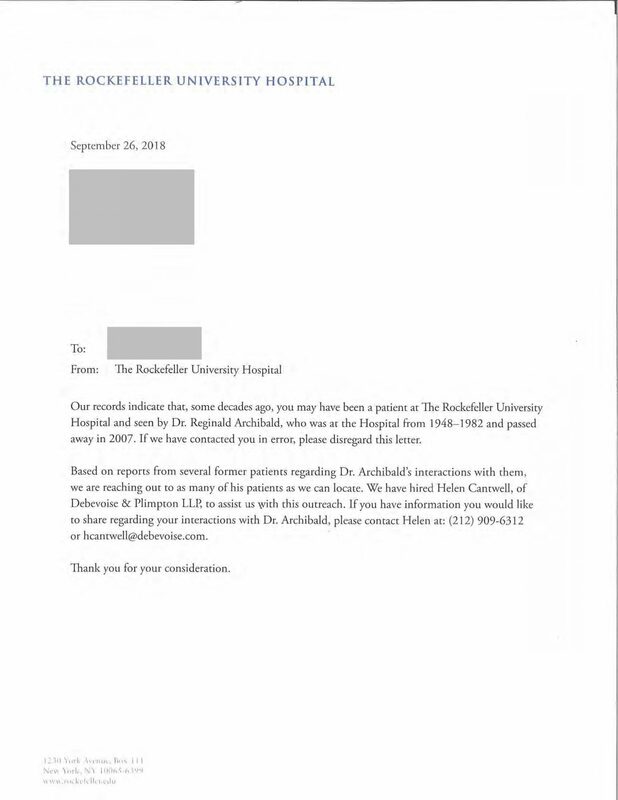 Update on Photographs: We have formally requested Rockefeller University Hospital return the photographs Dr. Archibald took of our clients, or explain what it has done to try to find them. Some of our clients and attorneys were interviewed about our efforts. You can read some of the news coverage here and here. We represent approximately 150 former patients of Dr. Archibald who allege they were sexually abused by him under the guise of “treatment,” and we have interviewed many more. If you or someone you love was a patient of Dr. Archibald, please contact us for a confidential consultation. There is no charge for speaking with us. 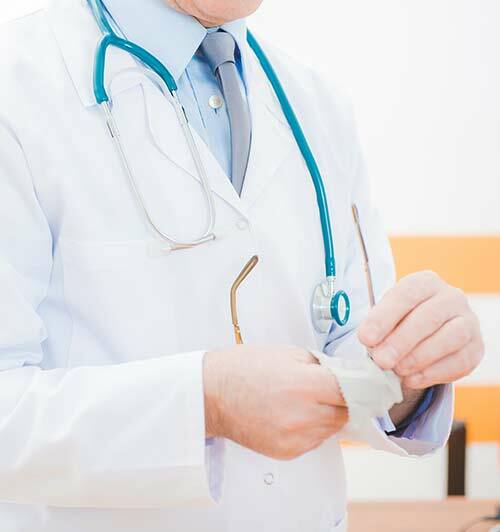 We highly recommend that you speak with us to learn your legal rights before you contact Rockefeller University Hospital or its defense law firm that has sent letters to his patients. You do not have to talk with the University’s defense attorneys to obtain your medical records. Speak with us to learn your rights. Below is a copy of the text from the University’s statement, followed by a copy of the letter that the University’s lawyers sent to some of Dr. Archibald’s former patients. We are attorneys who represent abuse survivors. We do not represent the University, Dr. Archibald, or any institution that allowed children to be abused. You can learn more about us by clicking here, and you can contact us for a free, confidential consultation by clicking here. We have come to learn that Dr. Reginald Archibald, who retired from the Rockefeller University Hospital in 1982, engaged in certain inappropriate conduct during patient examinations. The Hospital and University deeply regret pain and suffering caused to any of Dr. Archibald’s former patients. Dr. Archibald began working at The Rockefeller Institute for Medical Research (later, The Rockefeller University) as a visiting investigator in 1940, and at the Hospital as an assistant resident physician from 1941‐1946. He later returned as a Hospital senior physician and University professor from 1948‐1980, with medical staff privileges at the Hospital until 1982. He became professor emeritus in 1980 and senior physician emeritus in 1987. He passed away in 2007. Dr. Archibald studied childhood growth and maturation, focusing on children of short stature. processes designed to protect patients. Earlier this year, another former patient of Dr. Archibald’s, who had not been identified in the 2004 investigation, came forward to make a similar report. In response, the University again reported the matter to appropriate state and federal authorities and re‐engaged Debevoise to investigate further. The 2018 investigation benefited from additional information that was not available in 2004, including information from several former patients who came forward. Based on its investigation, the law firm concluded that some of Dr. Archibald’s behaviors involving these patients were inappropriate. In response to these findings, Dr. Archibald’s emeritus status at the Hospital and University have been rescinded and references to him have been removed from the Hospital and University webpages.